The villa was perfect for our needs including every facility necessary for a comfortable stay, the photos don't do the location enough justice as it really is set in the most stunning and breathtaking location - we woke up every morning to the glorious views over lake Trasimeno and thought that life couldn't get any better! The property is clean, maintained and so convenient for both Panicale and Paciano. Above all the lady who manages the property was beyond helpful, a joy to meet and simply able to provide so much valuable help about the local area. I would definitely come back and urge others to explore this amazing region of Umbria. In the very centre of Italy, straddling the border of Umbria and Tuscany, The Villa makes a great base for a memorable Italian holiday. Situated in an idyllic hillside position overlooking the Lake Trasimeno, the property is blessed with 360-degree views of iconic Italian landscape, yet within easy reach of a many of the world’s most important historical and cultural attractions. Whether you're interested in exploring the cities, savoring the delights of the numerous hilltop towns with their charming festivals, meandering through the countryside or simply relaxing by the pool, the possibilities are countless. Sleeping up to 8 + 2 PERSONS, this beautifully restored Umbrian farmhouse is arranged over two Apartments on the ground floor. For optimal flexibility, each Apartment has its own dining room, kitchen, indoor and outdoor dining areas. The owner’s family keep the first floor private for their occasional visits to the house. PARADISO APARTMENT X 2/4 PERSONS: 1 dining room/living room with a convertible sofa bed + 1 double bedroom with a convertible bed + 1 full bathroom with shower. The 12-metre swimming pool is positioned to take maximum advantage of the striking views across the valley towards the mountains. Surrounded on all sides by olive groves, vineyards and farmland, crops vary from one year to the next and are at their most colorful with sunflower, rapeseed or vine tomatoes. The fabolous Lake Trasimeno and Tuscany's highest hill-town, Cortona and Montepulciano, are laid out in front. A 15-minute drive gets you to the autostrada and from there it is just 60 minutes to Florence or 90 minutes to Rome. An efficient rail network gives you the flexibility to travel by train if preferred. Or if you’re more interested in exploring closer to home a number of bicycles are available for your use. Directions to Panicale, Castiglione del Lago: Driving north from Roma take the A1 autostrada in the direction of Firenze. After 140 km take the Chiusi-Chiaciano exit. Panicale is 20 km from the exit in the direction first of Chiusi, then Panicale. Driving south from Florence take the A1 autostrade in the direction of Roma. Take the Valdichiana-Betolle-Sinalunga exit, 100 km from Florence. Panicale is 25 km from the exit, in the direction first of Castiglione del Lago, then Chiusi. The house lies to the east of the main North-South rail line. Express trains stop at Chiusi (Chiusi Chianciano) which is 15 minutes from the house while regional trains stop at Castiglione del Lago (15 km). I teach literature, from Antiquity to the Middle Ages and the Renaissance: Virgil, Dante, Boccaccio, Petrarca, and Ariosto, among others. I'm now retired and I decided after many years of work to buy a splendid home in Umbria, Panicale. This is the exactly location I had in mind part of my life, where I can relax and enjoy with all my family and friends. My Villa is managed by our host Katia from Panicale, she will be happy to reply to you to all your questions. Please feel free to contact her!!! Have a nice holiday to our Villa!!! In their literary works, 'The Aeneid' and the 'Divine Comedy,' Virgil and Dante tell us of their journey in the Lake Trasimeno area, Panicale, and of the inspirations they found in this beautiful Etruscan city. Being in Panicale allows me to share the culture and the beauty that inspired these poets. Panicale allows me the opportunity to visit its Etruscan Museum which exposes all kinds of Etruscan artistic expressions--terracotta vases, jewelery, and much more-- that have been found in the territory of Lake Trasimeno. I fell in love for this wonderful Villa, because It is a 18th century stone Farmhouse with private pool on the Tuscany Umbria border. It is the perfect place to relax and enjoy a luxury holiday in privacy, space and comfort. Encounter the rural culture of this charming undiscovered region of Italy in an authentic stone villa, with pool, that has been recently renovated to the highest standards to create a home from home. 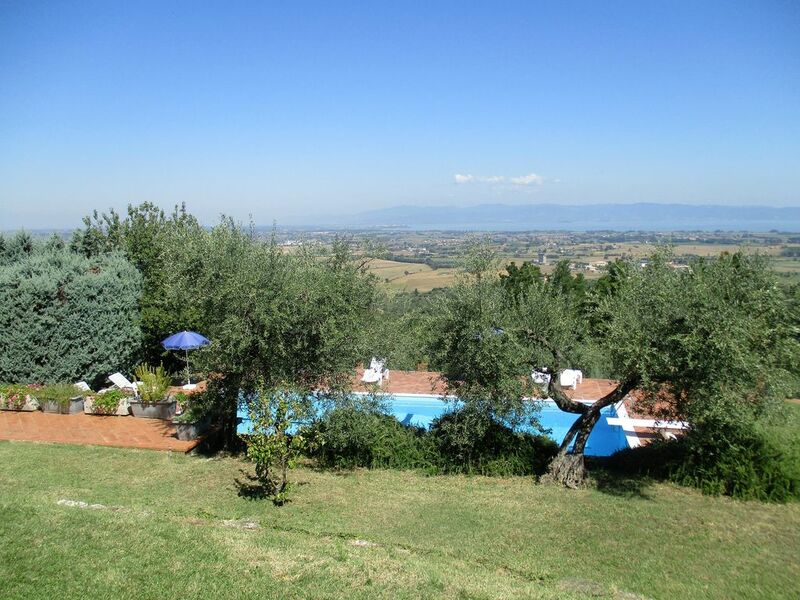 In 2010 I and my husband after to have work for all our life in Belluno,on the north of Italy, We decided to buy this lovely Villa with a spectacular view of the Lake Trasimeno located between Panicale and Paciano. This is an historical Villa with a splendid view of the rolling countryside and the Lake Trasimeno, close to restaurants, museums and other amenities. Its serene charm appeals to the artist in all of us and somehow brings us closer to the true lifestyle of the Panicalesi people who inhabit the town. A remarkable experience, not to be missed! Siuperb view of the Lake Trasimeno. Panicale...our home away from home! We were a group of two families (total of 10) who wanted to stay 11 days in the Umbria region. We found this property on homeaway.com which covered our need. We were not disappointed. The property was perfect, the view over the lake of Trasimeno breathtaking and the host (Katie) was very kind and helpful. We had the opportunity to both spend lazy days at the pool, visit the charming hill villages in the area, and also Rome was just 1 1/2 hour away by train. There were several opportunities in the area around the villa for jogging or walking. We will certainly recommend Villa Bell Posto. We're very grateful for the care and kindness of Katia as we returned to beautiful Panicale . We so enjoyed staying at Villa Bell Posto, especially with the stunning view and swimming pool. Lovely to be able to explore many great locations in Umbria along with lazy days by the pool. The villa had every thing we needed and was very comfortable for our family (2 adults and 2 teenagers). We really look forward to returning as soon as possible ! A wonderful tranquil place, wonderful views looking out pass the swimming pool, the olive grove, the valley, lake and hill towns beyond. The villa had everything we needed. It is close to some of the best hill towns in Tuscany and Umbria. Katia was so helpful and energetic, making sure everything went well for us. I would recommend it as good base to enjoy holiday in Umbria and Tuscany. We spent a lovely week with 3 families in this wonderful villa with the breathtaking view over the umbrian hills and the Trasimeno lake. The house is very clean and the furniture is very nice. Around the Villa there is a nice garden and the most fantastic thing is the swimming pool on the lower level! Katia was very available and helpful with everything which made you feel really 'at home'. I would definitely recommend this place to everyone!